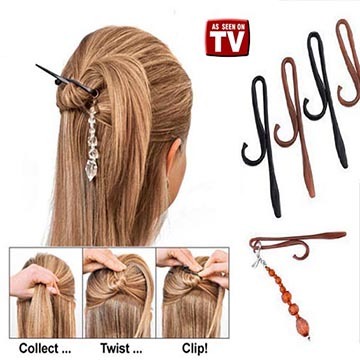 Twist N Clip is an easy-to-use clip that will hold your hair all day without loosening. 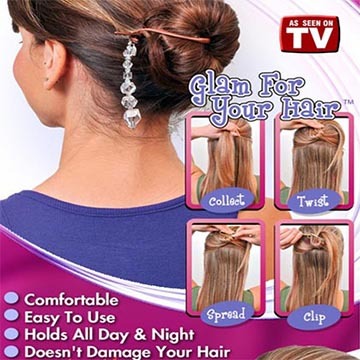 Most importantly, these jumbo hair clips are comfortable to wear throughout the day. They work great for any hair color or style, so you can wear them the way you want to. Simply collect your hair into a ponytail, twist it two to four times, spread open the Twist N Clip, slide underneath and clip like a safety pin. These hair headbands are gentle on your hair. 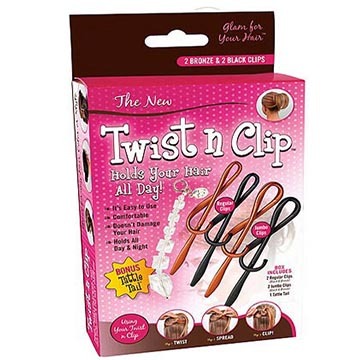 Included inside the As Seen on TV Twist N Clip are two regular clips, two jumbo clips and one tattle tail.